Using one of the most powerful supercomputers in the world to simulate the halo of dark matter that envelopes our galaxy, researchers found dense clumps and streams of the mysterious stuff lurking in the inner regions of the halo, in the same neighborhood as our solar system. "In previous simulations, this region came out smooth, but now we have enough detail to see clumps of dark matter," said Piero Madau, professor of astronomy and astrophysics at the University of California, Santa Cruz. The results, reported in the August 7 issue of the journal Nature, may help scientists figure out what the dark matter is. So far, it has been detected only through its gravitational effects on stars and galaxies. According to one theory, however, dark matter consists of weakly interacting massive particles (WIMPs), which can annihilate each other and emit gamma rays when they collide. Gamma rays from dark matter annihilation could be detected by the recently launched Gamma-ray Large Area Space Telescope (GLAST), which UCSC physicists helped build (see Currents story). "That's what makes this exciting," Madau said. "Some of those clumps are so dense they will emit a lot of gamma rays if there is dark matter annihilation, and it might easily be detected by GLAST." 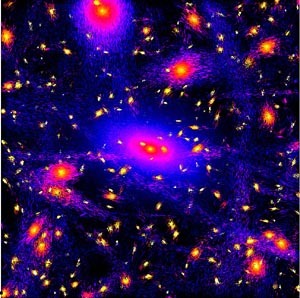 Juerg Diemand, a postdoctoral fellow at UCSC and first author of the Nature paper, said the simulation is based on the assumptions of "cold dark matter" theory, the leading explanation for how the universe evolved after the Big Bang. In a separate paper that has been accepted for publication in the Astrophysical Journal,, the researchers used their findings to make specific predictions about the gamma-ray signals that would be detectable by GLAST. The lead author of this paper is Michael Kuhlen, a former UCSC graduate student now at the Institute for Advanced Study in Princeton, N.J.
"There are several candidate particles for cold dark matter, and our predictions for GLAST depend on the assumed particle type and its properties," Diemand said. "For typical WIMPs, anywhere from a handful to a few dozen clear signals should stand out from the gamma-ray background after two years of observations. That would be a big discovery for GLAST." Although the nature of dark matter remains a mystery, it appears to account for about 82 percent of the matter in the universe. As a result, the evolution of structure in the universe has been driven by the gravitational interactions of dark matter. The ordinary matter that forms stars and planets has fallen into the "gravitational wells" created by clumps of dark matter, giving rise to galaxies in the centers of dark matter halos. According to the cold dark matter theory of cosmological evolution, gravity acted initially on slight density fluctuations present shortly after the Big Bang to pull together the first clumps of dark matter. These grew into larger and larger clumps through the hierarchical merging of smaller progenitors. This is the process that Diemand and Madau's team simulated on the Jaguar supercomputer at Oak Ridge National Laboratory. The simulation took about one month to run and followed the gravitational interactions of more than a billion parcels of dark matter over 13.7 billion years. Running on up to 3,000 processors in parallel, the computations used about 1.1 million processor-hours. "It simulates the dark matter distribution from near the time of the Big Bang until the present epoch, so practically the entire age of the universe, and focuses on resolving the halo around a galaxy like the Milky Way," Diemand said. "We see a lot of substructure, even in the inner part of the halo where the solar system is." The simulation revealed numerous subhalos and streams of dark matter within the halo of the Milky Way, and more substructure appears within each subhalo, Madau said. "Every substructure has its own sub-substructure, and so on. There are lumps on all scales," he said. The most massive of the subhalos would be likely to host dwarf galaxies such as those observed orbiting the Milky Way. By studying the motions of stars within dwarf galaxies, astronomers can calculate the density of the dark matter in the subhalos and compare that with the densities predicted by the simulation. "We can make comparisons with the dwarf galaxies and stellar streams associated with the Milky Way. The appearance of these stellar systems is closely linked to the substructure of the dark matter halo," Diemand said. The central densities in the simulated dark matter subhalos are consistent with the observations of stellar motions in dwarf galaxies, he said. But there remains a discrepancy between the number of dark matter subhaloes in the simulation and the number of dwarf galaxies that have been observed around the Milky Way. Some subhalos may remain dark if, for example, they are not sufficiently massive to support star formation, Madau said. In addition to Diemand and Madau, the coauthors of the Nature paper include Michael Kuhlen of the Institute for Advanced Study; Marcel Zemp, a postdoctoral fellow at UCSC, who developed a time-stepping algorithm that made the simulation remarkably accurate; and Ben Moore, Doug Potter, and Joachim Stadel at the University of Zurich. This research was supported by the U.S. Department of Energy, NASA, and the Swiss National Science Foundation. Note to reporters: You may contact Madau at (831) 459-3839 or pmadau@ucolick.org, and Diemand at (831) 459-2526 or diemand@ucolick.org. Movies and images of the new simulation can be found at via lactea project.